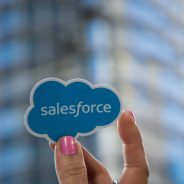 Salesforce.org, the charitable arm of a cloud-computing company based in San Francisco, has been in a philanthropic relationship with two Bay Area school districts for five years now. This year, the combined $15.5 million donations put their contributions over $50 million. San Francisco Unified School District will be receiving $8 million, and the slightly smaller Oakland Unified School District will get $7.5 million. The money is earmarked for STEM support, teacher training, and mindfulness projects. Mindfulness, while something of a workplace buzzword, is a big focus for Salesforce’s charity organization. They want to promote education that takes into account a student’s whole life, a “whole child,” approach. “Because we know that what happens outside of the classroom impacts what happens inside the classroom,” explained Ebony Frelix, the executive vice president and chief philanthropy officer of Salesforce.org. Putting their money where their mouth is, the organization also donated $2 million towards fighting youth homelessness, announced in the same breath on September 25, by Salesforce CEO Marc Benioff. London Breed, current Mayor of San Francisco, lauded the philanthropic organization. Oakland Unified School District, which will receive $7.5 million, has formed a “Principal’s Innovation Fund,” where the money can be used at the individual school level. So far, they have used past donations to create a makerspace, support students who are refugees, and incorporate mental health services, all of which increase the ways in which students can access their education. More of the funds have also gone into training teachers to more effectively teach and use technology, and to make computer science education more available.